Her Role: Sherry is the Founder of the Applied Behavior Center for Autism and President of ABA Programming Inc., its parent company. She oversees financials and leads the executive team. Her Story: Sherry has worked with families affected by autism for more than 20 years, beginning when her youngest son was diagnosed with autism in 1995. Sherry was drawn to Applied Behavior Analysis (ABA) therapy because it offered evidence-based treatment for autism. She was the first in Indiana to provide ABA therapy through home groups in 1997, and has since grown ABC to 8 locations. Her Heart: Sherry's passion is helping families with children who have autism gain quality services and funding to enhance the child's future and improve quality of life for the whole family. Her Role: As CEO, Molly oversees day-to-day operations, manages our clinical operations and corporate staff, and drives the vision of ABC. She also serves as Legal Counsel. Her Story: Molly brings a wealth of experience in both the legal world and the autism community. After receiving her Bachelor's degree from Purdue University and graduating from the Loyola University Chicago School of Law, Molly ultimately opened her own firm specializing in representing ABA providers and families with children with autism. Most recently, Molly served as President of an ABA billing and consulting company, furthering her experience and knowledge within the autism community. Her Heart: "I'm a guardian. While I'm not able to help our kids by working with them directly as a therapist, I am able to protect them and advocate for them. I want the world to see how strong, vibrant, and wonderful people with autism really are." His Story: Chad began his career more than 10 years ago working with people who have developmental disabilities and autism. This experience helped shape his appreciation for the challenges and victories they faced on a daily basis. Now, at ABC he looks forward to making a direct positive impact on the people we serve. Chad graduated from Franklin College with a degree in Psychology. His Heart: "As the father of two boys, I realize the importance of solid community resources to enhance personal growth and development. I want parents and family members to know: you are not in this alone." His Story: Rich has worked for large corporate organizations for 30+ years within the Human Resources function. Rich has his Bachelor’s degree and MBA with majors in Human Resources Management from DePaul University. Originally from Chicago, Rich has lived in Phoenix, St. Louis, and Baltimore prior to moving to Franklin Township in Indianapolis in early 2015. His Heart: Rich has worked with and mentored youth for 30 years and was looking for an organization with a mission he could call his own. Rich has a passion for coaching, developing, and helping individuals be successful. Rich is married to his wife Claudia who is originally from Mexico. Rich is fluent in Spanish. They have two children Andres and Ariana. Her Role: As Clinical Director, Kari oversees programming and clinical staff at our Early Childhood Center and Carmel, Indianapolis West, and Terre Haute locations. Kari is also a Board Certified Behavior Analyst. Her Story: Kari has an undergraduate degree in Psychology from Ball State University and a Masters of Science degree in Psychology with a specialization in Applied Behavior Analysis from Kaplan University. She has achieved her Board Certification and has worked as a BCBA serving children of all ages. Her Heart: "I worked many years in the field of mental health as a crisis therapist until my then 3 year old was diagnosed with autism. That was a defining moment in my life. I decided that I needed to be properly educated in order to help my son live up to his full potential. I completed graduate school and fell in love with the world of ABA. The impact it can make in the lives of children and their families is monumental. I cannot imagine working in another field and I have a definite appreciation as a parent for those individuals working with our kids each day." Her Role: As Clinical Director, Kelly oversees programming and clinical staff at our Greenwood, Indianapolis North, and Richmond locations. Kelly is also a Board Certified Behavior Analyst. Her Story: Kelly received her Bachelor's degree from the University of Evansville and her Master's degree in Applied Behavior Analysis from Ball State. She started with ABC in 2009 as a therapist and has grown professionally with this company. As a BCBA, Kelly combines the behavioral aspects of ABA with various techniques to help achieve the greatest outcome for our kids. Her Heart: "I started working with children with autism when I was in college. After I graduated, I started working in pharmaceutical research and quickly realized it was not my passion. Within my first week at ABC I knew this was the place for me. I celebrate the little milestones that each one of my kiddos make and I truly enjoy getting to know them and their families. Who wouldn't love a job where I get to teach conversation skills which could eventually lead to them developing true friendships!" His Role: Vince is leading our new in-house Research Department, the first of it's kind for an ABA provider in Indiana. He also serves as our HIPAA Compliance Officer. 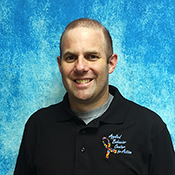 His Story: Vince has been practicing as a Board Certified Behavior Analyst since 2005. Over the course of his career, he has helped guide programs in early intensive behavior intervention, life skills programs, and transitions to adulthood. Research interests include: encouraging individualized ABA programming to promote rapid progress and advancing a conceptually systematic understanding of ABA teaching procedures. His Heart: "My heart lies in outcomes. The impact of ABA goes beyond simply teaching skills. ABA therapy can have life-altering effects. I'm passionate about tracking what we think we can accomplish and then what we actually accomplish. Outcome data is the key to continual improvement and truly building brighter futures." Her Role: Jenn is conducting research for our new in-house Research Department, the first of it's kind for an ABA provider in Indiana. Her Story: Jenn has practiced as a Behavior Analyst since 1997. She received her Master’s degree in Applied Behavior Analysis from Ball State University and gained experience at one of Dr. Lovaas’ Young Autism Project replication sites. Her expertise is in early intensive behavior intervention. In 2016 the Arc of Indiana recognized her contributions to children with autism with the Kathleen Clark Professional Service Award. Her Heart: "My heart is to continue the groundbreaking work that Dr. Lovaas provided for our field through his outcome studies. My passion lies in providing rapid progress for life changing skill development so children with ASD have a chance to catch up to their typically developing peers. I want to share the practitioner knowledge I learned at the Young Autism Project with other young professionals in the field by providing insightful supervision and publishing helpful research papers." Her Role: As Director of Enrollment, Michele plays a major role in connecting children and their families to ABC, where they are finding hope, encouragement, and success with ABA therapy. Her Story: Michele started in the classroom as a preschool teacher after earning a degree in Early Childhood Education, and eventually became director of the facility she was teaching at. Having the knowledge of the classroom and the opportunities to reach out more in the community, Michele found a passion for being an advocate for children and education. Her Heart: "Having a child with autism, the opportunities at ABC allow me to continue down the path I have always loved, sharing my journey and helping families and children with their own unique journey." Her Role: As an Enrollment Specialist, Jacinda helps connect children and their families to ABC, where they are finding hope, encouragement, and success with ABA therapy. Her Story: Jacinda comes to ABC after working for a healthcare provider that offers services to nursing facilities, schools, and correctional facilities. Jacinda served as Lead Enrollment Specialist for two years, where she built close relationships with patients' families and walked with them step-by-step through the on-boarding process. Her Heart: "Unfortunately, I don't have the pleasure of working with the children one-on-one in therapy. However, I do have the great pleasure of assisting the families first hand, and showing them what ABC brings to the table for their child or loved one. I'm elated to be a part of something so special and inspiring."